In the eastern half of the United States, periodical cicadas, called Magicicada, come up out of the ground every 13 or 17 years when the ground warms up to 64 F. Often mistaken for locusts, which are technically grasshoppers, cicadas are large flying insects, about an inch and a half long, with black bodies, red eyes, and delicate wings. 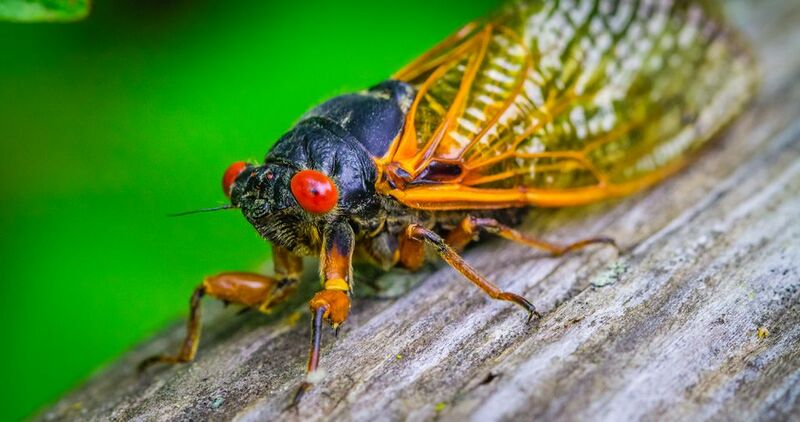 The Beltway area — Washington, D.C., Maryland, and Virginia — has its share of cicadas most years. In 2017, a group of District cicadas emerged earlier than the 17-year life cycle suggested. Some experts claim climate change is to blame, others say the grouping of cicadas were looking to pioneer or accelerate their process to establish a new line or brood. Cicadas live all their life underground as nymphs and emerge as adult cicadas ready to mate. If a cicada is lucky to escape predators and live out its life cycle, then it might live 4 weeks above ground before it dies. When the cicadas emerge, they are far too many to count. You see them everywhere—on the sidewalks, on the trees, on the porch, and on the street. Usually, in early to mid-May, the cicada nymphs crawl out of the ground, onto trees and shed their skins. The males sing very loudly to attract female mates. Cicadas are among nature's loudest creatures with a range of 85 to 100 decibels. The females lay their eggs in the branches of trees. The nymphs hatch and burrow several inches underground. The above-ground cycle lasts less than four weeks. Beginning in mid-June, the adults all die. Male cicadas die soon after mating. Females lay 400 to 600 eggs before they die. Entomologists have mapped out "broods" or groupings of cicadas by year and location. These broods are on the same 13- or 17-year timeline together. There are 12 broods, each in a different area of the country, of 17-year cicadas. There are three broods of 13-year cicadas. As a result, it is possible to find cicadas in almost any year by traveling to the appropriate location. For example, the two broods that are Washington, D.C. residents are the East Coast Brood II, which last emerged in 2013 and is due to return in 2030, and the Great Eastern Brood X, which last emerged in 2004 and is due to return in 2021. Some experts believe that the early emergence in 2017 in Washington, D.C. might have been Brood X trying to come out early and establish a new brood. Fortunately, cicadas do not bite or sting so they are not harmful to people or pets. They generally leave no lasting damage, except possibly to some young trees and shrubs. Tree growth appears to decline the year before the emergence of a brood, because of the increased feeding on roots by nymphs. You might find that the cicadas are annoying, although many think the cicadas and their unique life cycle are fascinating. Moles feed on nymph cicadas and seem to thrive the year before an emergence, but suffer the following years because of the disappearance of the food source. Also, wild turkeys benefit greatly in a cicada emergence year by gorging on the adults on the ground as they die.